With all the over the counter products available today that claim to whiten teeth, it is only natural to wonder – is professional teeth whitening worth it? The truth is, there are pros and cons to having your teeth whitened in the dentist’s office and doing it yourself at home. Learn what you need to know about tooth whitening to decide what option is best for you. What happens with professional teeth whitening? As well, depending on your tooth color issues (genetically, some people have to work harder to maintain today’s standard of whiteness) as well as your diet, you may also need to use a professional take-home kit for touch-ups afterwards. For instance, if you genetically have more yellowed teeth, or if you have used tobacco or other products that have stained teeth (medication can also cause staining), you may need to have an in-office appointment and then use an at-home kit or come back for a second in-office appointment. What happens with OTC at-home teeth whitening? 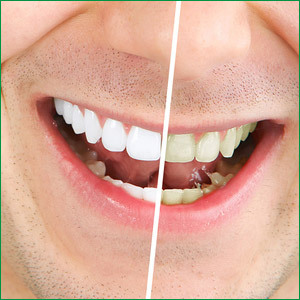 With at-home over-the-counter teeth whitening, you will need to choose the method(s) you plan to use and then supervise the whitening process yourself. This can work out to be cheaper – especially if your discoloration issues are mild, you don’t smoke, and your diet is relatively free from staining elements – but you may need to try out a few products to find the best one. You can choose from strips, pens, toothpaste, trays, or some combination thereof. You can also choose to have a dentist make you customized trays for your upper and lower teeth, and then purchase the solution from the dentist or online and use the trays daily at home until your teeth achieve the desired level of whiteness. you can afford to wait to see the results. Regardless of which teeth whitening treatment you use, it’s always a good idea to seek professional advice from a qualified dentist before you decide. If you are unsure of how to proceed, come in for a complimentary consultation.